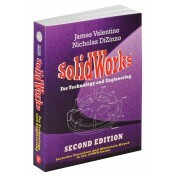 SolidWorks for Technology and Engineering provides a comprehensive introduction for students. Little or no prior experience is needed to benefit from this liberally illustrated work. Use the book in any educational setting from four-year engineering schools to community colleges and vocational / technical schools and industrial training centers. The book is also a reliable reference on the job. It functions well as a self-study manual. Authors Valentino and DiZinno have carefully and thoughtfully arranged the contents in a clear, logical sequence. Many hundreds of well-drawn visuals supplant wordy explanations, demonstrating the power of the software. Many learning aids are included throughout the 500 page book. • Strong graphical illustrations rather than long text and definitions are emphasized. Key definitions are boxed in. • Examples provide step-by-step instructions, supported with excellent graphics. • Needless cross-referencing has been eliminated. Each example is presented with all explanations appearing on the same page. • A CD provided with the text contains files that are keyed in sequence to the selected examples. Students can follow interactively when learning the procedure with the concepts presented in the text. • The text contains exercises and materials that are key to preparing students for the Certified SolidWorks Associate (CSWA) exam. Appendix B contains a complete key and sample exam solutions.